I have a page for Organization. 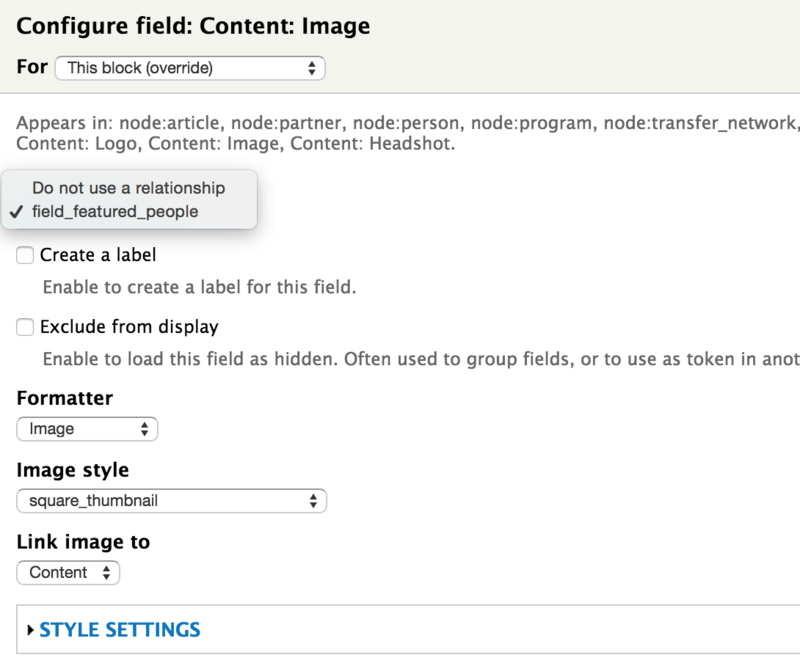 Each organization has a Featured Person field which is an unlimited node reference to the Person content type. The organization can have many featured people. I also need to be able to customize the markup for each view-row and therein lies my problem. I set up the view according to another question. The view is able to select and display the correct Person data only when Show: Content. AFAIK, this does not let me customize the markup for each row because the rendered markup is sent directly to the template. If I change to Show: Fields in order to get more control over the theming, the view will display the fields related to the organization, not the people (since I am on an organization page, and the contextual filter is set to the organization id, I suppose). How do I set up my view so I can display the relationship content (Featured People) and still customize the template for each row or people? With Show: Field, each individual field can be toggled to any of the relationships in the view. It is similar to Show: Content and Show: Rendered Entity except the dropdown list is buried one step further down. Switch to Show: Field, and edit each field and set the dropdown list to the Featured Person relationship. Then, go about your theming just as you would with any other fields template. Not the answer you're looking for? Browse other questions tagged theming views or ask your own question. How can you create a list of referenced nodes in a view? How to output view content as grid in custom template? How to template a view and be able to manipulate the content with it? How can I pass variables from views template to node template?